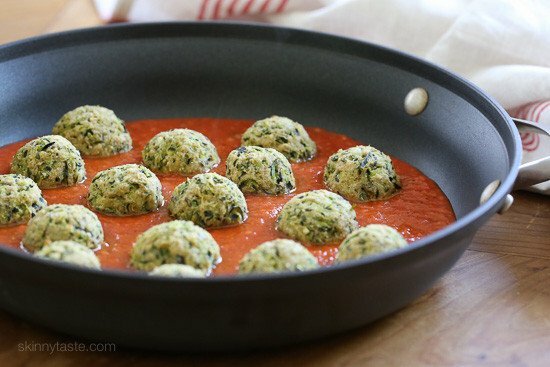 A few weeks ago I made these awesome eggplant “meatballs” and the most asked question I got in the comments and on Facebook was can you make them with zucchini? Loving the idea, especially since I have a few giant zucchinis on my counter I put this to the test and they turned out awesome! I had to change the recipe a bit from the eggplant one since zucchini is very watery, and they turned out great, even better than the eggplant in my opinion and everyone who tried them, loved them! 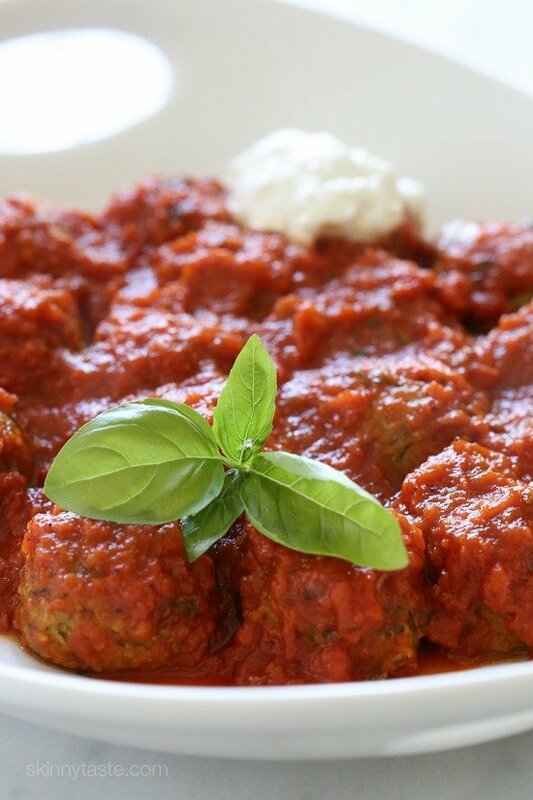 These meatless meatballs were a HUGE hit in my house, I even let my neighbors and friends try and everyone loved them! Made with grated zucchini, garlic, Pecorino Romano, basil, bread crumbs and egg, then baked in the oven and finished in a pomodoro sauce. Place the olive oil in a large nonstick skillet over medium heat. When hot add the garlic and saute until golden, about 30 seconds. Heat the sauce in a large deep skillet to warm the sauce, about 4 to 5 minutes. Add the meatballs to the sauce and simmer for 5 minutes. 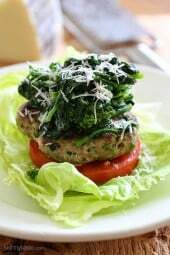 Garnish the meatballs with fresh basil leaves and serve with ricotta or grated cheese if desired. These turned out really flavorful. The zucchini “meatballs” pair really well with a marinara sauce. 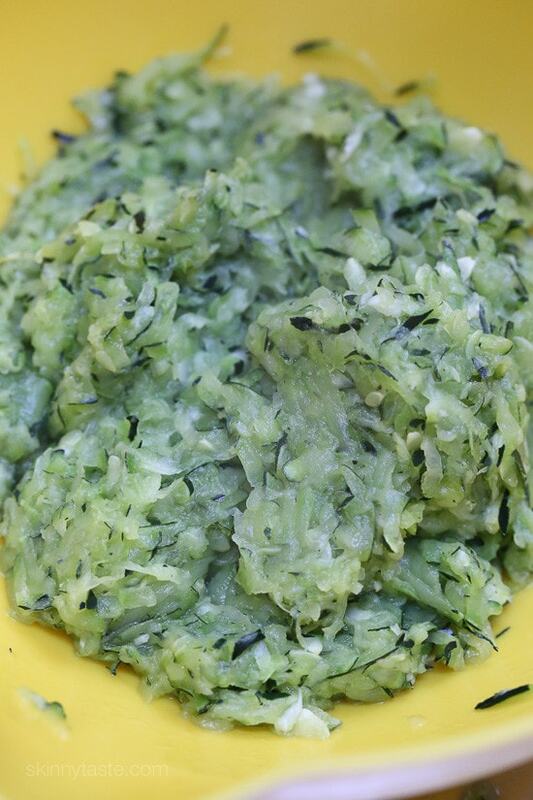 Instead of grating the zucchini, I put it in my food chopper, it turned out fine and saved me time. 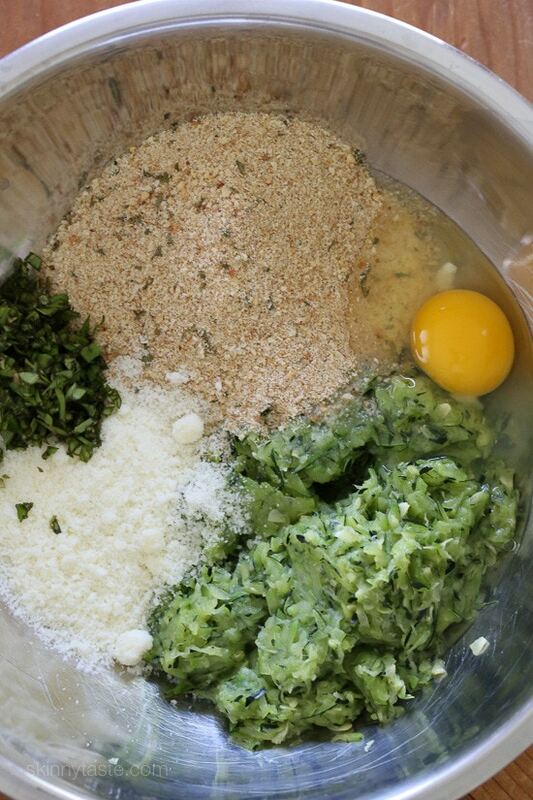 The recipe looks more labor intensive than it actually is, I found it to be similar to making zucchini bread with the added step of shaping the “meatballs”. I love that this recipe gives me another way to trick myself into eating a vegetable I normally wouldn’t. 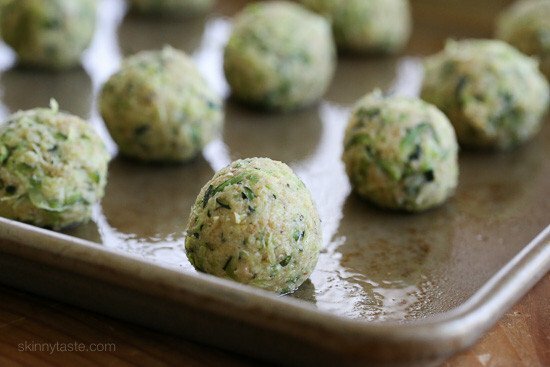 Can I freeze the zucchini meatballs? These are delicious! I wonder if I could use dried basil. These have become a staple at my house! We broil for 5 minutes at the end then don’t cook them in the sauce to keep them extra crispy. I love them!! My toddler loves homemade turkey meatballs. Do you think I could add turkey to this recipe (1 lb and maybe an extra egg if it’s needs more moisture) to sneak in some veggies for her? I am doing a big freezer stock up next week before baby #2 and would love to make these- hopefully with turkey!! Hi, How many cups of zucchini???? I will be making this up tonight! Super delicious! Does anyone know if I could bake them in an air fryer, how and how long? Thank you! Greetings from Austria! Made these for vegetarian family members at Thanksgiving. They were a big hit with everyone! I made them on Wednesday, served Thursday in marinara sauce over gnocchi. Honestly they tasted even better the second day. I thought they tasted a bit too salty. I’ll cut down on salt the next time. So good! I crave them. Make them for my vegetarian husband and the whole family devours them. Great recipe! Hi, is the nutritional info for the meatballs alone? Or including the sauce? Some of the recipes on the website are different from the ones in the books. Are the ones here or in the book tweaked to perfection? Any idea how many cups of zucchini? I have various sizes of zucchini so knowing how many cups would be so useful! 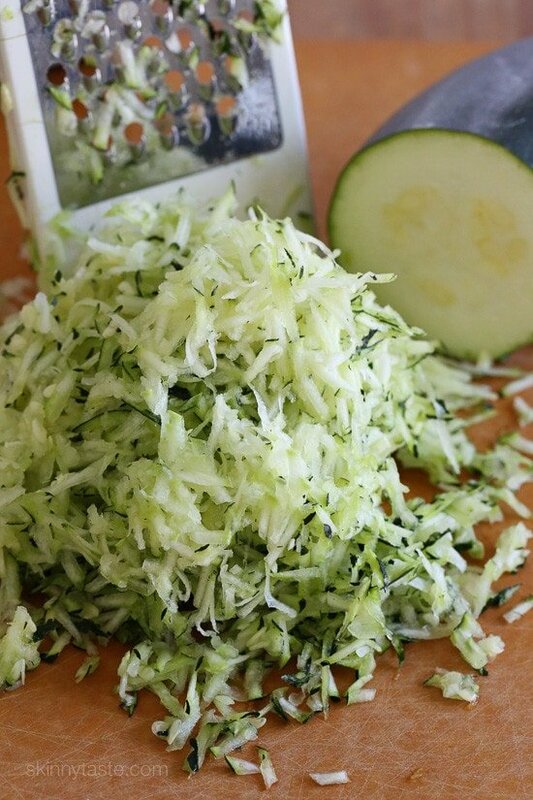 How how many cups of grated zucchini would it be as I already have mine grated? I need to know the same thing! 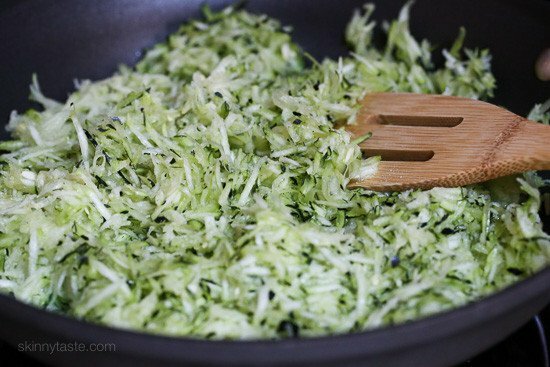 I don’t have a food scale; I bought medium sized zucchini’s from the store to make this recipe – how many medium zucchini’s would you say are needed for this recipe? 2? Just came out of the oven; 2 medium zucchinis was perfect. The meatballs are soooo good! Can these be frozen after cooking? is the weight for the zucchini before or after it is squeezed out? Can the “meatballs” be made ahead? I need to have a dinner ready to go after I pick a vegetarian friend up from the airport. Just wondering how well this reheats. Thanks – looks like a great recipe. These came out awesome!! My family eats gluten free and we were out of breadcrumbs so I substituted almond flour. They came out so good. Will definitely make again. Great job! 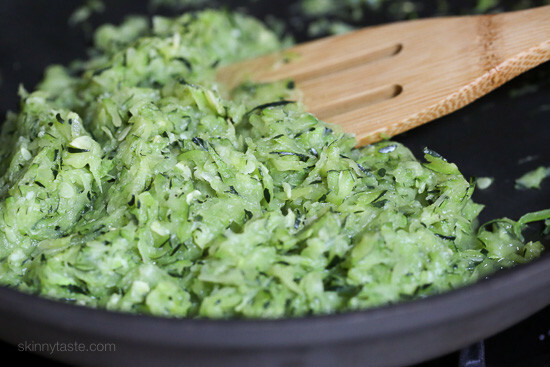 I was combing this site for recipes that use shredded zucchini, because I have overgrown zucchinis, which tend to be fiberous and gritty when eaten by themselves. I told my friend I was making vegetarian meatballs and she made such a face and wished me good luck sarcastically, but this were really actually quite tasty. I used the quick marinara sauce from your site (a staple in my kitchen now) and served over whole wheat spaghetti. 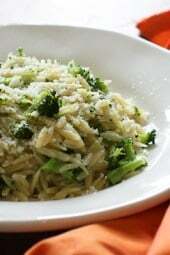 Thanks for this recipe, and all your other shredded zucchini recipes! Made these for the first time tonight and my husband has requested it be our dinner every Saturday night! Honestly, I they were fabulous. I’m not vegetarian but my husband is, and these “meatballs” made us both happy! I made these for dinner last night, and they were fantastic! My husband was very skeptical, but he thought they were great too. I followed the recipe exactly. Grating the zucchini is the hardest part. The rest of the recipe was easy. I will definitely make these again! 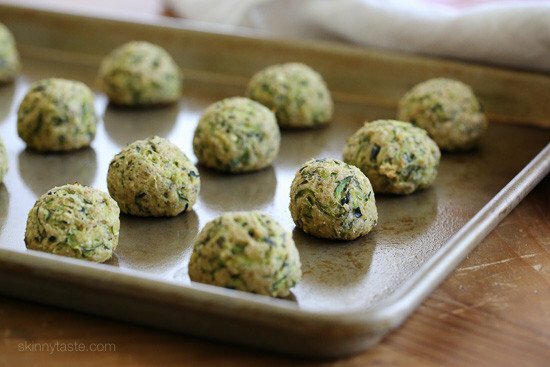 Michelle, I made these and founding that grating the zucchini was so easy because I used the Pampered Chef Veggie Strip maker – I did a 3 lb zucchini in 3 minutes – no lie! I made this recipe with a mixture of Panko breadcrumbs and Italian seasoning instead of Italian breadcrumbs, which worked really well! I even sprinkled a little mixture of Panko, parm, and Italian seasoning on top of the “meatballs” for extra texture. Delicious, versatile recipe! Thanks, Gina. I can see the time, love and attention that you put into your recipes, and it’s much appreciated! 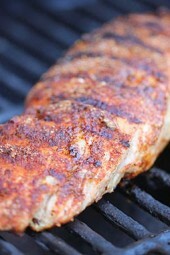 Your blog is my #1 cooking resource, especially since I started WW. You rock! Could you freeze these before baking? If so, how would that affect bake time?